The landscape of healthcare is constantly evolving, especially the landscapes of the patient, the physicians, nurses, and caregivers. At the same time, the industry is evolving with regulatory changes, a demand for greater customer service, a demand for more convenience, all with a reduction in costs. With all these different pieces impacting the patient care model, engagement (literally defined as ‘a pact; an agreement) can get be easily overlooked and yet it is so critical to patient safety, care, and satisfaction. Engaging a patient occurs on many different levels and requires that the physicians, nurses, and caregivers have an understanding of the patient’s skills and ability, as well as their desire to manage their own care and their willingness for honest, bi-directional communication with caregivers. One way to engage the patient in their own care is with rounding. Rounding ensures that the bi-directional communication occurs between patient and caregiver. Its goal is to identify when that communication is lacking or is not addressing the proper issues so corrective action can take place. There are several different types of rounds that can help engage the patient in their care. Pre-Admission Rounds – This is the first opportunity to engage the patient. Educate patients on procedures, surgeries, treatments, and medications before they occur right at the time of admission. Nurse Rounds – It is been proven that nurse presence with hourly rounding throughout the stay prepares patients and educates patients on the discharge process, as well as what to expect after the discharge process. In addition, hourly rounds can identify early warning signs of complications or adverse events that could prevent a discharge. Leadership Rounds – Leadership rounds support a patient-centered care concept where all parties are communicating and engaging with the patient, ensuring the highest level of patient care and satisfaction. Discharge Rounds – Completing discharge rounds, as well as follow-up discharge rounds, ensures patients have a complete understanding of their medication timing, dosage, frequency, and the ability to ask questions and have complete clarity, a complete understanding of discharge plans, and receive complete information on post-discharge care. When a hospital can engage a patient successfully not only is the recovery time often reduced but patients are healthier and achieve better outcomes. While a healthy patient is without a doubt the most important benefit, there are also several other benefits when a patient is engaged in their own care. 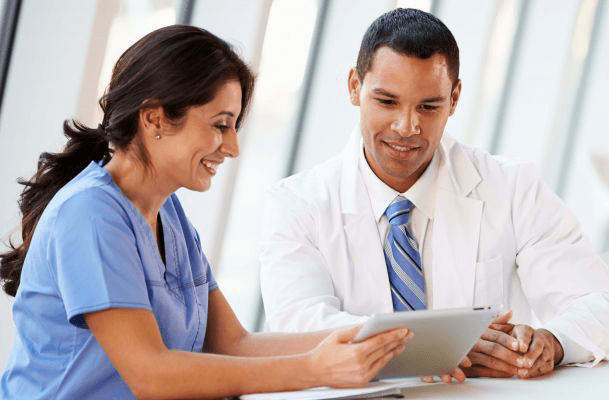 Improve Patient Satisfaction – By leveraging technology such as a rounding solution to engage patients through bi-directional communication there is a significant improvement in the process of care as demonstrated by an increase in satisfaction scores by 13% and an increase in positive comments by 50%. Improved Quality & Safety – When it comes to improving the quality and safety of a patient, engaging a patient has proven benefits. During rounds, patients are both educated and engaged; leading to a reduction in falls by 52% and a 34% reduction in patient complaints. Reduce Cost – An engaged patient understands and participates in their care; reducing readmissions, liability and lawsuits, as well as unnecessary calls to physicians saving a healthcare organization significant dollars.